As someone with an interest in game design who enjoys simulation games and a gamer who has watched the gaming industry grow since the 8-bit era, I am a perfect representation of the target audience for Game Dev Tycoon. It should be no surprise that I found the game hard to put down. Game Dev Tycoon is about making games and growing a company from a one man team working out of a garage to a respectable game company. And though it is missing a few obvious features, it manages to be both addicting and fun. At first Game Dev Tycoon seems to be shockingly simplistic. After coming up with a company name and creating a game designing character, the garage level involves only creating games and trying to make enough money from them to pay the bills. At this stage, game design is a simple matter of coming up with a title, deciding on a topic from a list of randomly unlocked choices, matching the topic to a genre, picking a platform, and choosing which aspects of the game’s design to focus the most resources on. It isn’t long before the bugs are squashed and the game is completed, released and reviewed, and the company gains a bit of experience in each category of design. The reviews are kind of funny—they are a number and a one line description that can range from “Meh,” to “Outstanding!” From there, income will start flowing in depending on the quality of the game—which is pretty much directly tied to review scores and whether or not a certain type of game is trending on the market—and then it’s back to the drawing board to make another game. I was surprised at how much fun I had at this part of the game, despite its simplicity. Coming up with a creative title and matching the right genre to the right topic was fun, and I could count on a lifetime of gaming experience to guide my decision making and focus my resources properly. Of course a fantasy RPG needs a stronger storyline and better dialogue than an old west action game! For the most part, the common sense of the average gamer should be enough to make some decent games. But when common sense isn’t enough, Game Dev Tycoon provides a few features to help players understand the intricate details of the industry. Once a game is released, the player can generate a game report which reveals whether or not a genre is appropriate for a platform or if a topic matches a genre. Later in the game, when target audience research is unlocked, these reports also reveal how well topics, genres and platforms work with the various demographics. The report also gives insight into which aspects of game design are the most important for the type of game that was released. While running game reports and designing games, the player will earn Research points which can be used to unlock new game features and technologies, unlock new topics, and to improve the skills of the game designer and later, his or her employees. This is where Game Dev Tycoon starts to get complicated. Getting more topics to choose from and improving skills is straightforward enough, but researching new technologies is bit more involved. Once researched, new technologies can’t be utilized until the game company develops a new engine to use for future titles, and even then, the technologies need to be hand selected during game development at an added expense. Although designing an engine is as simple as choosing which researched features to include and waiting some time for the engine to be finished, it is also an expensive prospect, and it’s easy to run out of money while attempting to implement new technology. At that point, you get one loan and a year to pay it off before getting booted back to the title screen. Assuming you are able to avoid bankruptcy and have enough success with your games to earn your first million dollars, you can then move your company out of the garage and into an office. Here you can hire your first employees and start to develop larger games. Medium sized games take more time to develop than the small games from the garage, and each aspect of the game’s design must be assigned to a specific employee. For example, if one of your employees is a technology expert, it makes sense to assign him or her to develop the game’s engine, whereas an employee more focused on design should work on the storyline or dialogue. Managing your employees and avoiding overworking them is essential to developing good games. Make sure to send them on vacation when they get tired, or else you might develop some horrible games. At this stage it also becomes important to advertise games during their development in order to build hype and ultimately increase sales. If a highly reviewed game is released your company will earn fans, but if you release a dud, you might lose some. Having lots of fans is a great way to increase hype, and when combined with advertising and attending an E3-like gaming conference, it’s possible to drastically improve a game’s performance. All it takes is one near perfect game to keep the company afloat for years to come. On the other hand, a series of failures could prove punishingly expensive, especially as the cost of paying employee salaries, advertising and game development costs start to add up. Managing all this is part of what makes the game so addicting. I often found myself staying awake playing Game Dev Tycoon and saying to myself, “I’ll just develop one more game,” and inevitably continuing to play even after doing so. If my company was in danger of running out of money, I found it impossible to quit until I either made a successful game or went bankrupt. Eventually Game Dev Tycoon becomes a bit of a juggling act. Between making games, developing employee skills, researching new technology, developing engines and managing staff, you might long for the simplicity of working out of the garage! But the more success you have, the more depth the game will layer on, and after a lot of hard work you will be developing multimillion dollar multi-genre AAA titles and praying that they don’t fail miserably once released. 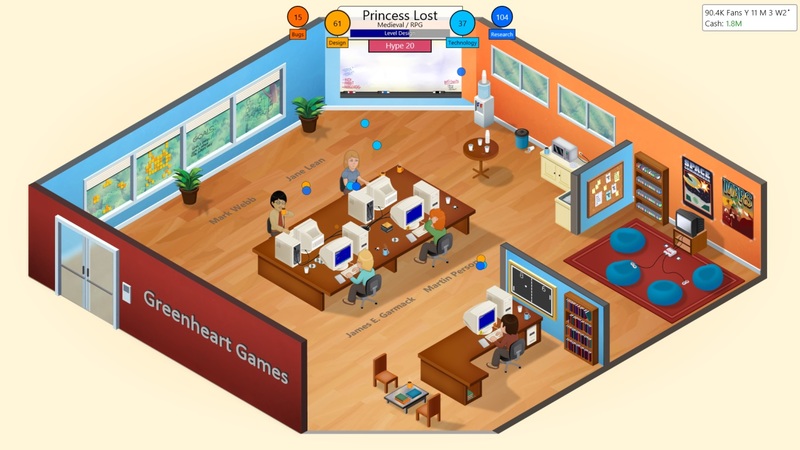 Throughout Game Dev Tycoon a slightly off version of the history of video games unfolds. For example, early on Nintendo releases their NES, though the company is called Ninvento and their console is called the TES. It’s almost always obvious which real world company and platform is being referred to (at least to anyone that grew up in the 80s), though no real names are used in the game. It even goes over some of the more interesting points in gaming history, like when Sony was developing a CD-rom add-on for the Super Nintendo, or when the Dreamcast arrived and seemed to be so successful before ultimately failing and ending Sega’s role as a hardware developer. 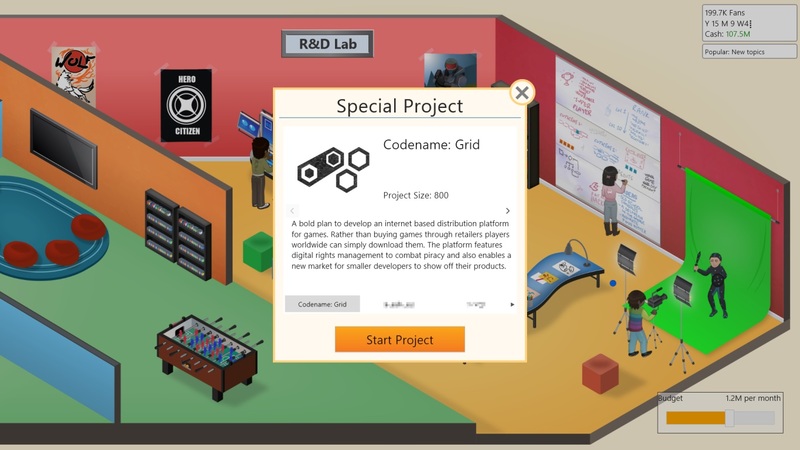 Game Dev Tycoon covers everything from the Commodore 64 to the PlayStation 4 and Xbox One, and even the generation that follows before all is said and done. At that point, the player is given their final score and allowed to keep playing. It’s interesting that this simulation game has such a specific beginning, middle and end that are all tied to this real world timeline. Usually simulation games don’t have an ending! I was a bit surprised when the game nonchalantly told me that this would be my last year. In my case, the first time I finished the game I felt like I was still in the tutorial, since I had yet to unlock several features. Though I kept on playing the same save file afterward, I look forward to going back and seeing how successful I can be within the game’s time limit. The game also has a variety of random events that occur throughout the game. You might get invited to participate in an interview about a game you are developing which can have a positive or negative effect depending on your answers. You also have to deal with moral issues like whether or not to allow fans to create their own games based on your game, whether or not to release the code to one of your old game engines to the public or whether or not to pursue legal action against pirates. All of these decisions can help you gain new fans, or cost you some old ones. Meanwhile, behind the scenes the game keeps track of whether your actions are good or evil and that can have an effect on later events. While I normally chose the good decisions, it was also fun to later go back and create an evil company. With enough success, more features become unlocked late in the game. You can have as many as 6 employees (plus your original character), and they can be specialized to become experts in different areas of game development, such as an Artificial Intelligence or Gameplay. Assigning your staff appropriately during game development can be the difference between getting 9s and 10s on reviews. 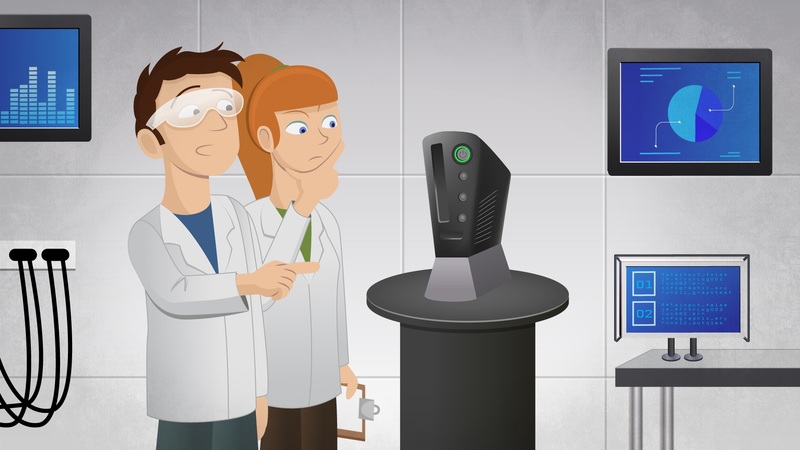 You can also add a research and development lab to your office, and this can be used to research things like AAA games, MMOs, or even to host your own conference (like BlizzCon) to show off your products. You can even research an online distribution platform like Steam, and start to make extra money off of PC titles. Eventually you can get into the hardware business and develop your own console. You can pick and choose which technologies to include, and can potentially create the best console on the market since there are a couple of advanced technologies late in the game that exceed the power of the systems available during the game’s timeline. Becoming a hardware manufacturer imposes new expenses upon the company, but should ultimately prove to be a profitable endeavor, and you can expect to see a bump in hardware sales every time you release a game for your own platform. 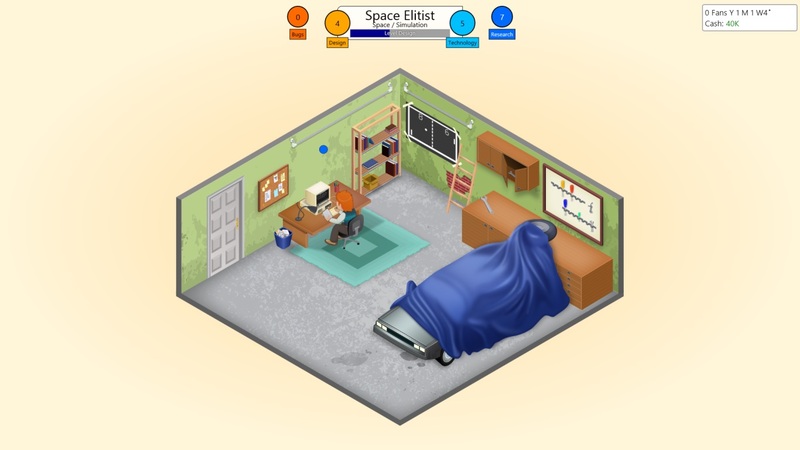 Between the research and development lab, hardware lab, AAA games and MMOs, the end-game of Game Dev Tycoon is much more complex than the humble beginnings of the opening chapter would suggest. And the game remains fun and addicting throughout (I end up playing several hours every time I launch the game), despite a couple of shortcomings. I suppose Game Dev Tycoon is a victim of its own ambition, and as a result, I ended up asking a lot of “Why can’t I” type questions as I spent more time with the game. For example, why can’t I charge subscription fees for MMOs? The game only supports a Guild Wars type model where the customer pays for the game only once, but it also increases the cost of maintaining the servers on a linear scale so that even with expansion packs, MMOs cannot remain profitable for long. No microtransactions either! In fact, I had a billion dollar company that was run into the ground due to the maintenance costs of an MMORPG despite it earning near perfect scores for its initial release and two expansion packs and being heavily advertised. Either I did something wrong, or this feature is half-baked. And why can’t I pay for an annual conference for my company instead of having to research it over and over again? And why can’t I choose how long to keep games on the market (aside from MMORPGs)? And why can’t I continue to advertise games once they are released? And why can I only have 6 employees when I need 9 specialists? Then there are the aspects of game design that are glossed over entirely. There’s no way to develop a mascot character for a game or the company. You can develop sequels to games, but you won’t see Mario or Sonic the Hedgehog type characters in Game Dev Tycoon. In fact, you don’t develop any creative details for the games aside from the title (which have no impact on the game’s success)! In this regard, Game Dev Tycoon lacks heart, and it feels like the answers to all of the “why can’t I” questions above might have to wait for the sequel, if such a game is ever developed. The other issue is that there is really no competition to speak of in Game Dev Tycoon. You get occasional insight into what genres are popular or what age groups are buying the most games, but you never hear about another company releasing a successful game or pioneering a new technology or topic. It would be great to be able to compare your numbers to the other companies throughout the country and world, kind of like how the Civilization games show the player Top 5 lists from time to time. It would also be interesting to have to deal with plagiarism lawsuits or take part in collaborative efforts. All in all, it feels rather lonely playing Game Dev Tycoon, as if this company you are working on developing exists in a bubble without any competition or outside world to speak of. Even the customers are merely numbers on a chart. You never get to see people lining up to buy your games or forming petitions begging for sequels to abandoned franchises, and when you create your own console, you might as well be the only developer making games for it. But in my opinion, the one thing Game Dev Tycoon is really missing is additional game modes. There is only one mode in the game, and it covers the entire history of video game development. But wouldn’t it be fun to play a variety of scenarios that follow the growth of specific companies (or their similarly named fictional equivalents)? Why not a scenario where you play as Sakaguchi of Squaresoft (or later Mistwalker) with bonuses to RPG development? Why not play as Miyamato of Nintendo and develop some great franchises while simultaneously releasing several generations of hardware? Why not play as Atari and attempt to do better than they did with the Jaguar, or as Amiga while preventing their decline in the 80s and early 90s? And beyond that, it would have been great to be able to start a new game while tweaking a few settings. For example, let me choose which stage to start in so that I can develop better games sooner. Let me choose to play with all topics researchable so that I can actually make a fantasy RPG right at the beginning of the game while trying to recreate Enix. Or let me get my company started not by creating a game, but by creating a console, so that I can compete with the other consoles throughout history instead of saving hardware development for the end game. Oh, and the game needs a lot more music. One track repeating over and over again really doesn’t cut it. Also, the graphics need improving, but I love the easter eggs and cameos in the backgrounds! I feel like there is incredible potential here for a sequel, and I really hope the developers at Greenheart Games plan on making one. In the meantime, I’m just glad that they recently added mod support to Game Dev Tycoon. Ari played 25 hours of Game Dev Tycoon before writing this review. He was not provided with a copy of the game for review purposes and purchased the game himself.